Provide Education and Training Programmes that include FETAC accredited courses. Provide assistance/support to the individual and their family in their own home or other identified locations. Enable the individual to live with dignity in as independent a manner as possible. Assist the individual to avail of the personal, social, educational and developmental supports as primarily defined by him/herself. The Irish Wheelchair Association strives to achieve these aims by providing Personal Assistants to give the practical help and support required in each situation. There are 3 categories of assisted living services ranging from the individual having full responsibility, joint responsibility to the individual requesting that the IWA take responsibility for the management of the assisted living services. Peer Counselling is a joint service offered by IWA and the National Council of the Blind in Ireland (NCBI). The service operates under the same principle as counselling but the difference is that all IWA/NCBI peer counsellors have a physical or sensory disability. The peer counsellors have trained in counselling skills and they combine these skills with their knowledge and experience of disability to provide a unique counselling service. This community-based service is available to members of IWA/NCBI, their families and significant others. An individual service tailored to meet your needs. Every client is different and the counselling that takes place reflects that difference. A place to tell your story in your own time and in your own way. An opportunity to explore the issues that are important to you in a safe and confidential environment. Peer Counselling Training is accredited by the National Association for Pastoral Counselling and Psychotherapy. All peer counsellors attend supervision meetings and are supported by a full-time psychologist/family therapist. If you would like to know more about Peer Counselling, email peer@iwa.ie. Alternatively, telephone 01-8186400 or our direct line 01-8338219 ( 24 hour message service ). Your application will be dealt with in the strictest confidence. IWA provides respite care in the following centres. Cuisle is our purpose built national holiday centre. Please contact the centres directly if you need further information. Broadford, Celbridge, Leixlip, Maynooth, Lucan, Kilcock, Ladychapel, Donadea, Enfield, Caddamstown, Edenderry, Carbury, Allenwood, Lullymore, Naas, Rathmore, Prosperous, Kilmeague, Staplestown, Straffan, Coill Dubh and Robertstown. Every day we have various FETAC courses for the members within the centre. We also have a fully serviced computer room which is opened daily. We have tutors in the computer room every day to give you help & support. 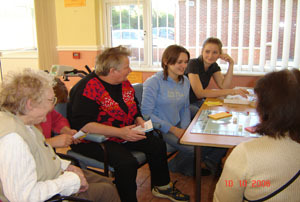 Swimming, Boccia, Cards, Crosswords,Community Training,Bingo, Outdoor Activities, Exercies, Physio & Aromatherapy. We organise regularly trips to cinema, bowling, shopping, picnics, historical sites or any place of interest that the members wish to visit. Supported Employment allows people with disabilities to enter or re-enter the workforce. It enables people with disabilities to be employed in paid jobs in the open labour market. A Job Coach assists the job seeker in all aspects of obtaining and maintaining a job in their chosen area. If you are attending the centre and find you would like to look for a job, a job coach will be assigned to you to help you in the employment area. We offer a service to members of the public in need of temporary wheelchairs. We hire wheelchairs from the centre. Please contact Christy on 045 861346 for more details. To establish an IWA local contact person for new members and information enquirers. To ensure new members are welcomed and given access to as much information on IWA services as possible. To gather data to inform the future development of services and the IWA advocacy programme. To identify people who wish to become involved in advocacy. To give people access to specific local contacts.